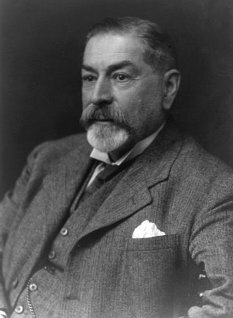 Frederick Bower decided early on that botany would become the central focus of his life. By the age of thirty he held an endowed chair at the University of Edinburgh, and remained there until his retirement. Bower was one of the foremost plant morphologists of his generation; from this starting point he pursued productive research programs in paleobotany, systematics, plant anatomy, and evolutionary biology. A man who did not shy away from theorizing, one of his most productive "working hypotheses" was his application of the alternation of generations model to explaining the way the land was colonized by early plants. This subject was explored most completely in his book The Origin of a Land Flora in 1908. Bower was highly respected by his many students and colleagues alike, and was the recipient of many honorary doctorates and other awards. --born in Ripon, England, on 4 November 1855. --dies at Ripon, England, on 11 April 1948. --Oxford Dictionary of National Biography, Vol. 6 (2004). --Obituary Notices of Fellows of the Royal Society, Vol. 6 (1949): 347-374. --The Linnean, Vol. 9(2) (1993): 29-36.